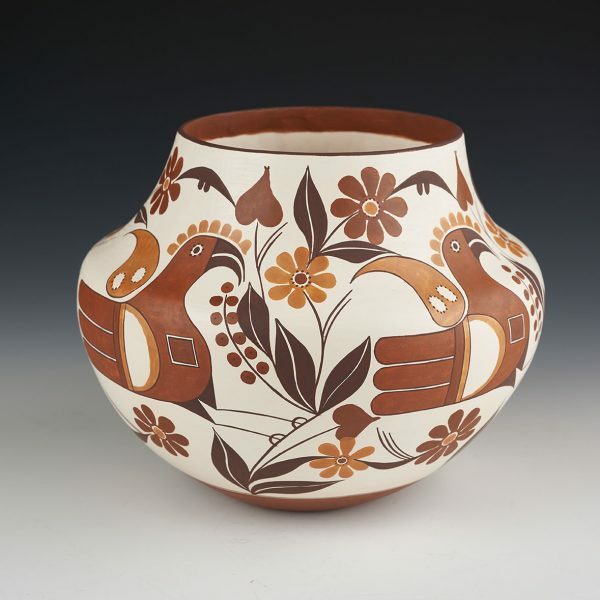 Delores is one of our last truly traditional Acoma potters. All her materials and all her techniques are time honored, like her ancestors’ works. The pottery walls are amazingly thin and consistent throughout. The design is painted to absolute perfection. Each line is thin and precise, and the application of the fill-in paint is consistent in texture. When Delores does her painting, she is often recreating design elements she has researched. She specializes in both miniature versions of 19th century potteries as well as larger jars and bowls. 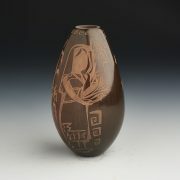 On the bottom of the piece, she puts the date of the original pattern she has seen on an earlier pot with its estimated date of creation. This new larger water jar revival design was researched to be from the 1880’s. It is timeless and superb! The varying tones of reds and tans make for a fantastically painted piece. Delores Juanico is a daughter of Marie S. Juanico (1937 – ) who was her mentor. 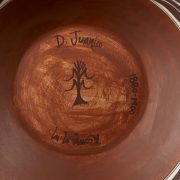 Marie learned pottery principals from her mother, Delores Sanchez, who lived to the age of 103. 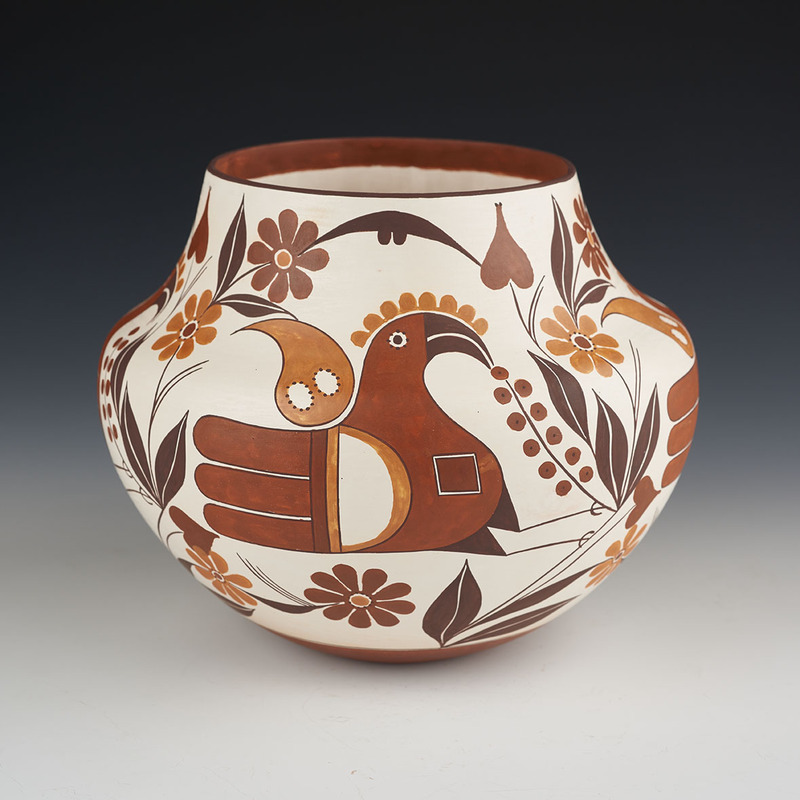 Delores carries on the tradition from her grandmother and mother of making the finest Acoma pottery. Her construction is traditional to Acoma pottery and the pottery walls are amazingly thin and consistent throughout. The design is painted to absolute perfection. Each line is thin and precise, and the application of the fill-in paint is consistent in texture. 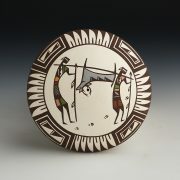 She certainly is among the top of today’s Acoma potters. When Delores does her painting, she is often recreating design elements she has researched. She specializes in miniature versions of 19th century potteries. 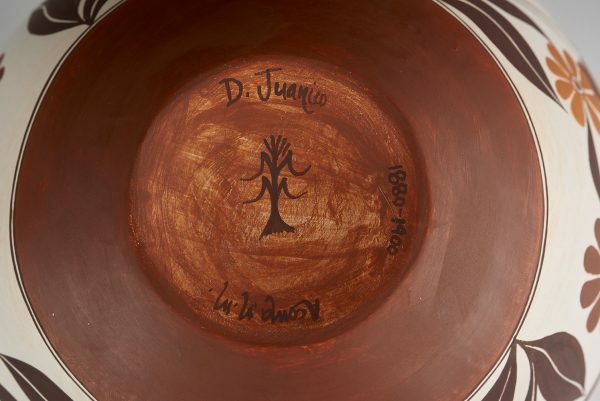 On the bottom of the piece, she puts the date of the original pattern she has seen on an earlier pot with its estimated date of creation. What a great tradition to follow and continue.